Myrtle Beach Singles may help single men and women of all ages make the most of their life in Myrtle Beach or their vacation here. Whether you're looking for that "someone special", or just looking for a friend to go clubbing with, there are a lot of activities here at the beach for having fun. Myrtle Beach Singles is your guide to the dating scene, including singles groups, singles clubs, singles personals, matchmaking, socials, nightlife, dating services, clubs, Christian, Catholic and Jewish singles groups, speed dating, wine tasting, and chat. Re-Opening within the next two years. For fun things to do now, check out nightclubs in Myrtle Beach, or churches in Myrtle Beach. 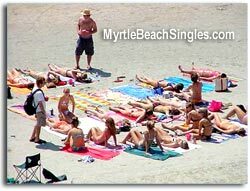 ©1999-2018 MyrtleBeachSingles.com - All Rights Reserved.